The tiny house movement is all about downsizing your lifestyle so you can live a more fulfilling life without a lot of debt or a huge mortgage hanging over your head. While you can buy a prefabricated dwelling or a customized small house on wheels, you can save a bundle if you make your tiny house yourself. 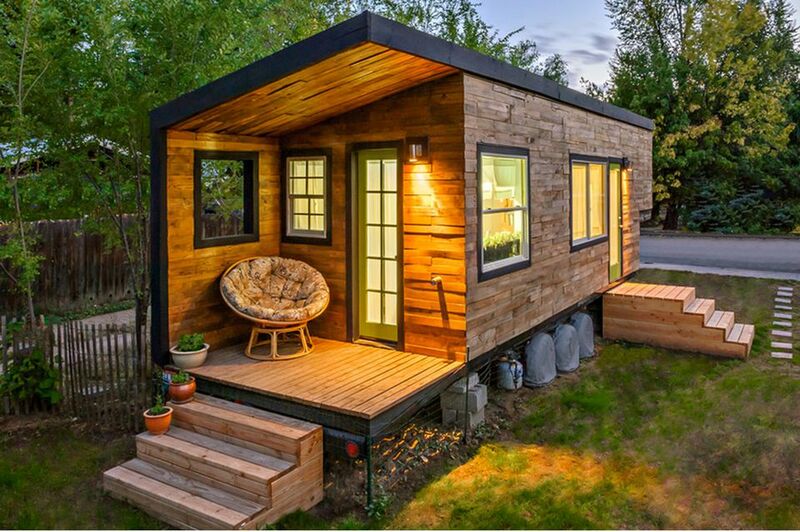 The average cost spent by a do-it-yourselfer building their own tiny dwelling is around $23,000, according to a 2015 survey. But you can build one for less--a lot less. Have a look at the following five tiny homes for some examples of how it can be done at prices ranging from $500 to a little less than $12,000. Bear in mind that prices will vary depending on your location, and when you build. Macy Miller purchased an old recreational vehicle for $500 and then spent the following two years transforming it into the beautiful 196-square-foot home shown above. Most of the home is made of upcycled materials. For instance, the siding incorporates wood from upcycled shipping pallets. The house is also loaded with resource-saving features, such as a composting toilet. For comfort, the tiny abode is tricked out with radiant floor heating. During that time, Macy fell in love, got married, gave birth and adopted a 150-pound Great Dane named Denver. Properly planned and executed, a tiny house can be perfectly comfortable home for a family. One New Year's Eve, Dave Herrle promised his wife that he would build her a tree house. So he did, and it soon became their second home. The project cost $4,000 and took six short weeks to construct, though this was possible only because Herrle is a skilled craftsman. Elaborate treehouses for adults are increasingly common as permanent residences for those dedicated to tiny house living. Dave's tiny house is nestled on a wooded hillside. The home features a raised deck overlooking the woods. Low-maintenance, natural wood siding covers the home, with aluminum roofing completing the cabin-like mood. These tiny dome-shaped homes are called Binishells. They are constructed using a process that is similar to making a papier-mâché balloon base. In this case, concrete is poured over a heavy-duty air pump bladder and a steel rebar framework. Next, the bladder is deflated to reveal a tiny, resilient home that can stand up to extreme conditions such as earthquakes, high winds or even lava flows. Originally used for emergency shelters and temporary structures such as auxiliary school classrooms, recent years have seen Binishells adopted by the tiny-house crowd. If you’re an urban dweller who fantasizes about building your own tiny vacation home, Pin Up Houses is a company that creates and sells building plans for tiny homes. The Cheryl Cabin shown above is a 107-square foot vacation retreat with a 47-square foot porch. The estimated construction cost is $2,900. The plans cost $29, and they come with a money-back guarantee. Finally, here is a fantastic custom tiny home built by Scott Brooks for a mere $500. Although it's only 83 square feet, it is remarkably cozy and comfortable. To slash building costs, he constructed this cozy Pacific Northwest abode out of salvaged materials, such as the large reclaimed picture window that looks out on the Northwest forest. How Much Does a Tiny House Really Cost? Would You Live in One of These Candy-Colored Tiny Homes?